Mobile accessories maker Tylt has options when it comes to portable batteries, seeing that they have a generous selection to choose from its lineup. With its Energi Portable Power line, they give power back to consumers by offering them in various capacities. One of them that we’re checking out, the Tylt Energi 5K+, sports a sizable 5,200 mAh battery that provides charging to up to 3 devices simultaneously. One striking characteristic that stands out from the get-go is its slim-line design, which measures in with a depth of 9/16”. Unlike most portable batteries, this one is sporting a considerably smaller frame, making it much more compact to hold and carry along. Constructed primarily out of plastic, its rectangular design is broken up by a colored strip that runs around the entire body with the Tylt name plastered on it. On one side, there’s a flush button that lights up in three distinct colors that indicates its battery level – green for a capacity of 70% to 100%, amber for 31% to 70%, and red for 3% to 30 %. Giving us flexibility, a full-sized USB port on the unit enables us to juice our devices using our appropriate charging cables. 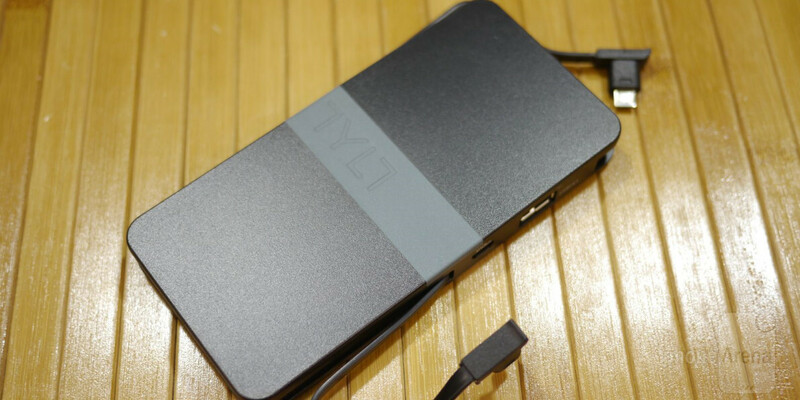 Furthermore, there are microUSB and Lightning docking cables integrated into the Tylt Energy 5K+ that tuck away discretely into the body when it’s not used. It’s worth mentioning too that it features a 3 amp circuit, which lets us juice up to 3 devices simultaneously. Overall, we like its compact design and integration of two of the most popular charging cables out there – it’s much better than having to rely on our own charging cables via its full-sized USB port. Needless to say, it’s more than equipped at giving most smartphones two full charges, but its $89.99 cost is rather pricey considering there are higher capacity portable batteries that can be snagged for cheaper. I would give it an 8 instead of 7,I mean,its a portable battery,it doesnt need to be good-looking But price can be questioned,since it can charge up to 3 devices (I dont know if any other portable device can do that) and its small,portable chassi can be an advantage over bulky,uncarriable portable batteries out there..